Our lab aims to understand the molecular mechanisms that underlie interactions between bacteria and their eukaryotic hosts. We focus primarily on the bacterial pathogen Vibrio cholerae, which causes the diarrheal disease cholera in humans. V. cholerae is also a natural inhabitant of marine and estuarine environments, and associates with diverse aquatic organisms from the microscopic zooplankton and phytoplankton to larger birds and fish. To dissect the molecular mechanisms underpinning these interactions, our lab performs experiments using the model arthropod Drosophila melanogaster, or the common fruit fly. 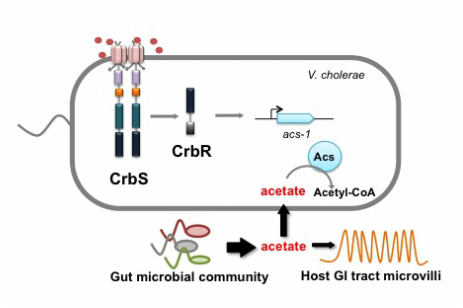 Our work has focused on the CrbSR two component signal transduction system and mechanisms by which Vibrio cholerae manipulates levels of acetate and other short chain fatty acids in a host during infection, a finding first reported by Hang et al. (2014). Acetate -- a key bacterial metabolite found in high concentrations of the gastrointestinal tracts of many organisms, and produced by the host's own microbiota -- may be an additional inter-domain signaling molecule, and effects of this metabolite on host physiology are significant. The mechanisms by which V. cholerae and other pathogens control levels of this small molecule are poorly understood. Together, we are an energetic and enthusiastic group taking biochemical and genetic approaches to the investigation of fundamental questions of bacterial physiology, symbiosis and pathogenesis using V. cholerae and Drosophila as a powerful model system. We welcome you to explore our research projects and contact us with comments, suggestions, or possibilities for collaboration! We also encourage students to join our lab – check out the join us page for opportunities! We strive to provide a welcoming, encouraging, and intellectually stimulating environment in which we explore the fields of microbiology, infectious disease, genetics, and microbial ecology in the context of a model host-pathogen system. As a lab, we value everyone’s diverse experiences, perspectives, and ideas. All students, when they join the lab, become integral and valued contributors to the uncovering of new scientific knowledge. We treat each other with respect, and work side-by-side to troubleshoot protocols, consider new hypotheses, and try new procedures. Together, we work safely, ethically, responsibly, and conscientiously to design and perform experiments that will contribute to our understanding of the genetics mechanisms that underlie the spread of global infectious disease. We welcome all students with the enthusiasm, perseverance, dedication and interest in microbiology to join us. We are now funded by the National Science Foundation! We are located in the Department of Biology at Amherst College in Amherst, MA.